Scooper - Technology News: Is this the end of globalization? While global trade also fell in 2009, the explanation was obvious: The world was experiencing a sharp contraction in GDP at the time. Last year, however, the world economy grew by a respectable 3% . Moreover, trade barriers have not risen significantly anywhere, and transport costs are falling, owing to the sharp decline in oil prices. Tellingly, the so-called Baltic Dry Index, which measures the cost of chartering the large ships that carry most long-distance trade, has fallen to an all-time low. This indicates that markets do not expect a recovery, meaning that the data from 2015 could herald a new age of slowing trade. The obvious conclusion is that the once-irresistible forces of globalization are losing steam. The situation in China is telling. In recent decades, as it became the world’s leading trading economy, China transformed the global trading system. Now the value of both imports and exports have fallen, though the former have declined more, owing to the collapse of global commodity prices. In fact, commodity prices are the key to understanding trade trends over the last few decades. When they were high, they drove increased trade – to the point that the share of trade to GDP rose – fueling hype about the inevitable progress of globalization. But in 2012, commodity prices began to fall, soon bringing trade down with them. Assume that one ton of steel and ten barrels of oil are needed to produce one car. In 2002-2003, that bundle of raw materials was worth around $800, or about 5% of the value of a $16,000 car. This implies that, during the early 2000s, industrial countries had to export five cars for every one hundred bundles of these raw materials they imported. By 2012-2013, the value of the raw materials needed for a car increased to about $2,000, about 10% of the cost of the same car (prices of cars had increased by much less). Industrial countries thus had to export double, namely ten cars for the same amount of imports of raw materials. Clearly, there is a direct link between the trends in trade and commodity prices (see figure). 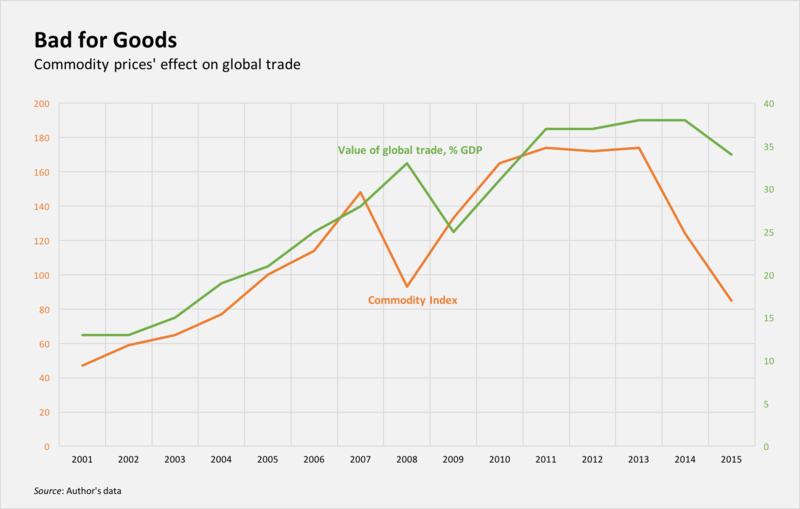 Given that this connection affects all manufactured goods that require raw material inputs, it should be no surprise that, as commodity prices have declined, so has global trade. Because food, fuels, and raw materials comprise about a quarter of global trade, when their prices fluctuate – especially as strongly as they have in recent decades – aggregate trade figures are obviously affected. Given the massive drop in commodity prices lately, there is little need to seek any other explanation for the recent slowdown in trade. This is not to say that globalization and trade are one and the same. Globalization entails many other features, including the surge in cross-border financial transactions and tourism, data exchange, and other economic activities. In fact, these other interconnections have fed back into trade, as they have enabled the emergence of global value chains, whereby different steps of the production process occur in different countries. But this phenomenon has been overestimated. According to the World Trade Organization, the foreign value-added contained in exports is only around 15% for most large economies, such as the United States and the European Union. In other words, global value chains have little impact on these larger trading economies. China is the only exception. Its position as an assembly platform for the world’s products meant that it imported most of the highest value-added elements of those goods. But as the country’s industrial structure matures – Chinese-assembled iPhones now contain more Chinese-made parts than they did just a few years ago – it will move closer to the US and the EU in value-added terms, not the other way around. This is yet another reason why trade might diminish in importance. When something is widely hyped, there is nearly always a real reason for it. Most economies are more open today than they were a generation ago. But it is now becoming clear that the perception that globalization is some overwhelming and inexorable force largely reflected the side effects of the last decade’s commodity boom. If prices remain low, as seems likely, the next decade might well see global trade stagnate, as the trade pattern “rebalances” from emerging economies to the established industrial powers.